(Left) Image of copper-coated nanoporous polyethylene, the low emissivity layer. (Right) Scanning electron microscope image of copper coating shows that the surface is optically smooth for mid-infrared. 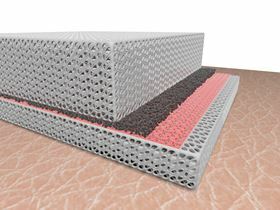 Schematic of two layers of coated nanoporous polyethylene sandwiched together face-to-face to create the 'dual-mode' textile. A novel textile based on nanoporous polyethylene (nanoPE) can keep the body warm or cool without the need for any energy input, according to researchers from Stanford University [Hsu et al., Science Advances 3 (2017) e1700895]. Maintaining a constant body temperature is a basic requirement of life and wellbeing. Clothing provides thermal insulation over a limited temperature range and can only follow fluctuating conditions.By contrast, actively managing heat emitted by the body using materials with different emissivity, transmissivity, and reflectivity offers a means of achieving personal thermal management. Now researchers have taken this concept of radiative thermal management a step further by creating a ‘dual-mode’ textile that can provide both warming and cooling. The textile consists of two emitter layers, one dark, highly porous 9-micron-thick layer of carbon and a smooth, shiny 150 nm thick copper layer, embedded in an infrared-transparent nanoPE film. Each emitter layer is fabricated separately and then sandwiched together face-to-face. If the high-emissivity carbon layer is facing outwards, the textile facilitates radiative heat transfer producing a cooling effect. If the temperature drops, simply reversing the textile so that the carbon layer is next to the body and the low-emissivity copper layer is facing outwards switches the textile into warming mode. The researchers demonstrate that the reversible textile can produce a 6.5 degree difference in the temperature of artificial skin. “This means that a wearer could expand their thermal comfort zone by 6.5 degrees and adapt to a wider ambient temperature fluctuation,” explains Yi Cui, who led the research. From numerical fitting of the data, the researchers predict that using materials with a more pronounced difference in emissivity could produce an even larger thermal comfort zone of 14.7 degrees. “The dual-mode textile is also soft, washable, breathable, and water-wickable, just like normal textiles,” points out Cui. The researchers believe that their dual-mode radiative textile represents a major breakthrough. Other dual-mode textiles based on solar absorption or wind barriers exist, but Cui believes their report is the first one of a radiative dual-mode textile. More seriously, such advanced textiles could protect against the effects of sudden and extreme temperature variation, which can lead to respiratory infections and cardiac arrest, and reduce the energy burden required to maintain constant indoor temperatures. The team is now working on nanoPE fibers that can be woven into textiles that are more similar to cotton and polyester. Other materials such as silica and aluminum are also being explored. Zijian Zheng of Hong Kong Polytechnic University believes that the work provides a new option in thermal management technology. “Previously, there have been reports on how to use thermal radiative fabrics for cooling or heating purposes. This work shows that, by using asymmetrically modified NanoPE films, one can obtain both functions and can select between them by flipping over the fabric,” he comments. However, from a practical point of view, there are challenges in applying this technology, he cautions. The comfort of the wearer will be key, he says, and how the technology is applied with other clothes. “The thermal model will be different and could be very complicated, but I think it will be really worthy of study,” he concludes. This article was originally published in Nano Today (2018), doi: 10.1016/j.nantod.2017.12.001. A project established by SGL Group to supply energy to a housing development area has won an environmental award.